The author of twenty-five books, Ayya Khema was ordained as a nun in Sri Lanka in 1979 and established several Buddhist centers before she passed away in 1997. From the best-selling author of Being Nobody, Going Nowhere, Ayya Khema's latest offering guides us along the path of Buddhist meditation with direct and practical advice, giving us contemplative tools to develop a healthy sense of personal being. 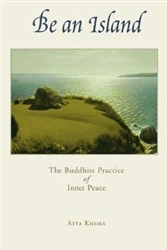 Be an Island is at once an introduction to the teachings of Buddhism and a rich continuation of Ayya Khema's personal vision of Buddhist practice.